THU 7/28 (3:45PM) — We now move on with the bracket for 7/31. Please read the previous post about the stretching out of this round of the playoffs. Basically the only thing that happened on 7/24 was that Hangover eliminated COG in the Losers Bracket. 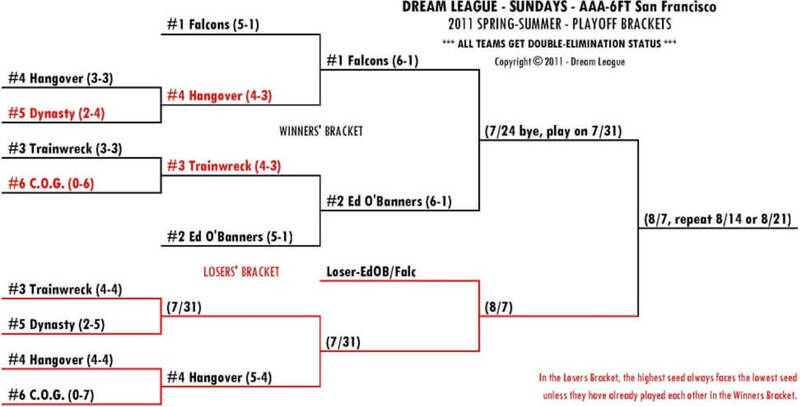 So with the issues last week, we have the Winners Bracket Falcons vs Ed O’Banners finally playing this Sun 7/31, while Trainwreck vs Dynasty and the winner of that vs Hangover occurs in the Losers Bracket. Trainwreck will conform to Dynasty’s timeframe. I understand that Hangover (or really, the winner of COG/Hangover from last week) has an advantage, but there was little I could do about it considering all of the complications from last week. THU 7/21 (2:45PM) — As mentioned on the 7/24 Bird’s Eye schedule page, due to various tipoff conflicts and impasses, we have stretched out the playoffs that were supposed to all happen on 7/24, to 7/24 and 7/31. That pushes the championship out to 8/7. Then, if a repeat championship is needed, we would probably need to skip 8/14. More on that below. Four teams were actually okay with changing 7/24 to span 7/24 as well as 7/31, with one team objecting. However, the one team that objected was really doing so because they had assumed the season would be done by 8/14 and decided to take vacation, despite my putting in bold on the registration calendar to not schedule vacation until September. Having said that, I have no interest in forfeiting a team just because they went on vacation. So if we do have a repeat championship and it runs into their vacation on 8/14, we will postpone the repeat championship to 8/21. There was further rebuttal that we have had “too many byes”, but if you look at the roadmap page, you will see that we took byes on Memorial Day, Fathers Day, July 4th, and then the one time when we only had OCHS available as an SF gym, following the unfortunate closure of MDLS. So I have not force-fed ANY byes (unless you want to hold me accountable for the takeover of MDLS) until now. I might also point out that this team didn’t start on time and so I had to give them a doubleheader makeup earlier in the season, not knowing how things would unfold. Therefore the first week bye can’t be held against me, either. Anyways, that leaves us with the bracket below. You can see in the Losers Bracket (“LB”) that Hangover vs COG will get started on 7/24, and the second half of the eventual doubleheader in that LB mini-final-four will take place on 7/31. With the lone Winners Bracket game left to be played on either 7/24 or 7/31, I let the Ed O’Banners take the option of either playing on 7/24 then bye 7/31 then championship 8/7, or bye 7/24 then play 7/31 then championship 8/7. I gave them the option and didn’t really ask the Falcons because the Falcons came in with another special request for 7/24, which sort of added to the mess. And the Ed O’Banners chose to play the last Winners Bracket game on 7/31. After that, the winner will play the lone survivor of the Losers Bracket on 8/7.